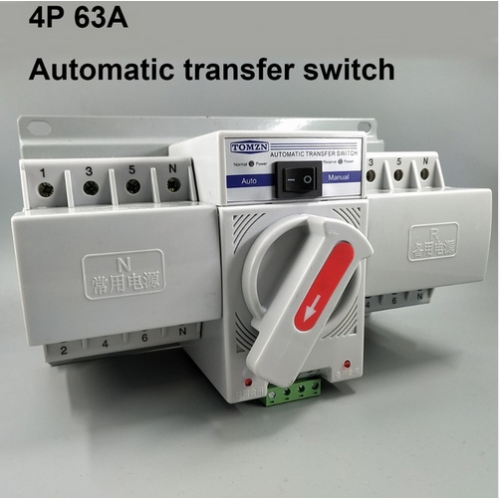 Automatic transfer switch ATS 4P 63A 380V MCB type Dual Power. 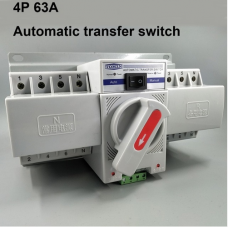 Home » Automatic transfer switch ATS 4P 63A 380V MCB type Dual Power. Noted: power will be interrupted when Switching. 1. 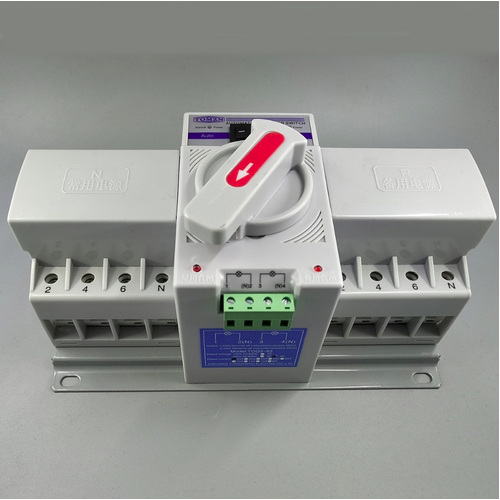 Dual power Automatic transfer switch can switch to Normal power or reserve power automatically. Please noted that the switch can't turn on or turn off the generator. This switch Normal power first. If normal power on, the switch will switch to Normal power. If normal power off, and reserve power on, the switch will switch to reserve power. Press the button to Automatic, the switch will switch to Normal power or reserve power automatically. Press the button to Manual, Then you have to switch the Direction manually. TOQ3D is terminal type automatic transfer device. 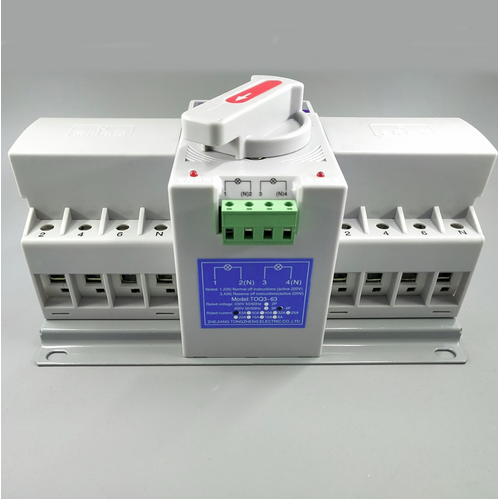 It's suitable for 3 phases 4 wires (or 1 phase 1 wire) dual power grid with AC 50/60Hz, rated voltage 400V/230V and rated current up to 63A. 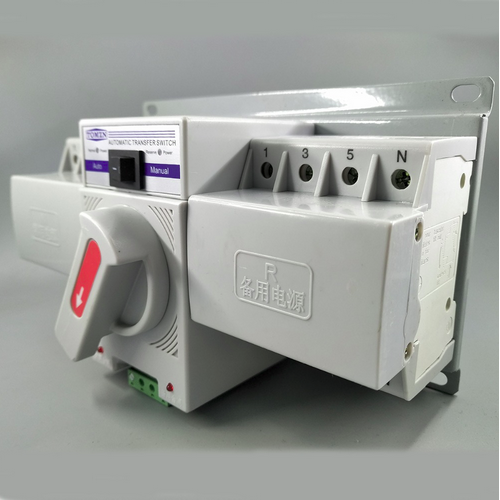 When one power goes wrong (only test normal Phase A voltage and reserve Phase A voltage, only test loss voltage or loss phase),it will automatic connect one or several load circuits from one power to the other power automatically, to ensure normal power supply of load circuits. LCD Digital Voltmeter 80-300V AC EURO 2 Round Plug. 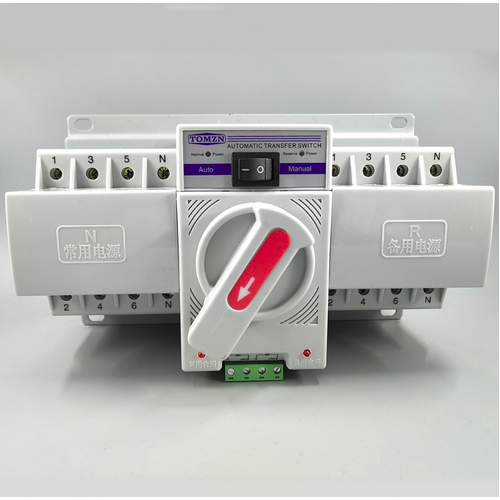 Wireless 4 Channel Light 220V to 240V Remote Control Switch and Transmitter. 12V(400A) or 24V(200A) Car Truck Boat Battery Isolator switch.